All food is fresh, locally sourced and cooked on the premises to create a delicious series of menus which are seasonal, healthy and nutritionally balanced. School meals are provided in partnership with Thomas Franks Ltd, whose ultimate goal is to inspire the pupils in every school to develop a life-long positive relationship with food. Our lunch menu operates on a four week rolling programme and we cater for all dietary needs and provide a menu that offers halal and vegetarian options. Home-made bread and a varied salad bar are also available every day. All the menus are available here. 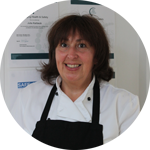 Julia Jones is in charge of catering at the Girls School. She would be delighted to discuss with you any individual dietary needs and can be contacted via the Girls’ School Office.